Just a word on descents, in particular the descent of Mont Ventoux, which, nearly to a man/woman, is something nobody ever thinks about before climbing Le Geant. And who can blame them – there’s enough to be concerned about with the climb. But if you go up you need to get back down (actually, I met a guy in the gift shop on top two days ago asking the cashier if she rented bikes to do the descent without messing with the climb. He thought it would be a natural business opportunity), and with Ventoux you do have a choice, even if you have parked in Bédoin. For me there is no competition. The descent down the north side of the mountain (to Malaucène) is by far the most enjoyable, with views over the Southern Alps (if you dare take your eyes off the road), generally less steep roads, and far fewer cars. It’s really a pleasure. Here is the only descending photo I can find of this side, taken on the steepest section near the top. If you are an adrenaline junkie and love road furniture like cars and other cyclists, back to Bédoin might be for you. 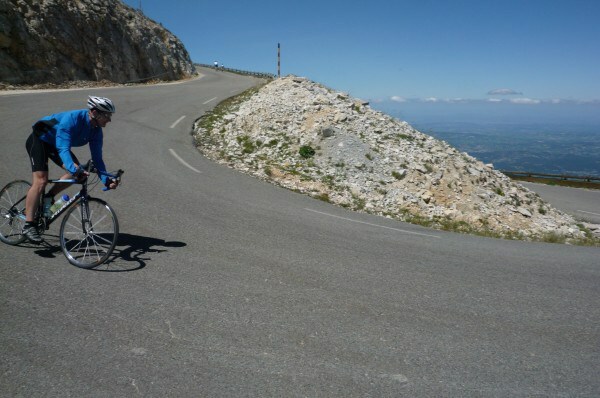 This entry was posted in Cycling and tagged Descending Ventoux. Bookmark the permalink. As we previously talk about, I will be climbing Le Geant from Bédoin on July the 6th. Is there any chance we can share the climb? Please contact me to arrange a meeting. Any clues to spend the night before (accomodation, …)? Cheers, friend. Love your blog! Hey Carlos! Sending off an email toute de suite!